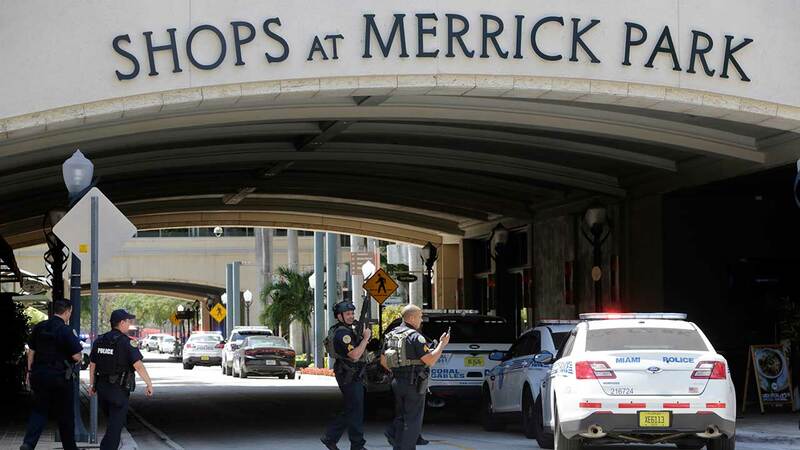 One person is dead and two wounded after a shooting Saturday at a gym in the upscale Shops at Merrick Park mall in Coral Gables, Florida, officials said. The shooting apparently occurred during a dispute between a former employee and managers at the Equinox Fitness Club, Coral Gables police told CNN affiliate WPLG. The ex-employee allegedly targeted two other people, the station reported. CNN could not independently confirm the report. Two people were airlifted to a hospital, Coral Gables Fire Department Lt. David Perez said. Another person was pronounced dead at the scene. No one was being sought in connection with the shooting, Perez said. The gunfire sent shoppers running for cover, according to witnesses. The mall was on lockdown for a time until police secured the scene. In videos posted on social media shortly after the shots rang out, an automated recording is heard: "Emergency -- evacuate or seek shelter." Sirens blare in the background. Tim Hartog, general manager of Yard House restaurant, said the business was on lockdown for a time. "We had everyone underneath tables and got everyone to the back," he said. "There's police everywhere." Susan Amat tweeted from the restaurant's kitchen: "Pray for safety for everyone at Merrick Park right now - everything is locked down - we're in kitchen of Yard House. Go Coral Gables Police!" Anais Michelle said she was walking into the mall with her mother when she saw people coming down from the third level, some crying about a shooting at the gym. Michelle said they hid in the back of a store. The shooting started about 1 p.m., witnesses told WPLG. Police said the area was secure about 40 minutes later, the station reported.